Being socially responsible is something that we take very seriously. 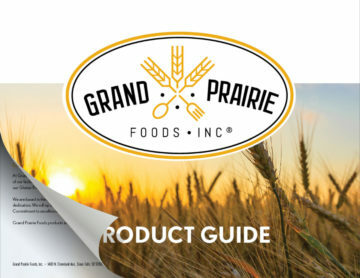 At Grand Prairie Foods, we support a diverse workforce – something we don’t plan to change. The majority of our employees are immigrants who have come to America in search of a better life. A new life that many have found with the help and support of our Grand Prairie Foods team. No one can say it better than those who work here and call Grand Prairie Foods “home”. Puna Sanyashi is a Bhutanese refugee who came to America nearly 6 years ago. Puna has been an employee of Grand Prairie Foods almost the entire time since she arrived in Sioux Falls. Since her start, Puna has been encouraged and supported by the Grand Prairie Foods team. This beautiful essay shows how she has grown and prospered in America because of her hard work and the opportunities she received through Grand Prairie Foods. Pedro Basilio started at Grand Prairie foods when he was 21. He started on the production line but through training, encouragement, and opportunity provided at Grand Prairie Foods, Pedro has continued to work his way up to a shift manager. Read more about Pedro’s story and the Grand Prairie’s approach to recruiting employees. We have achieved our dream growing from our humble beginnings of only 15 employees to our current workforce of nearly 200 employees. As we take advantage of opportunities to expand our business as private label food suppliers from packaging to sandwiches, we look forward to expanding our product offerings and our diverse workforce along the way. We are thankful for our continued growth and are constantly in pursuit of new and improved products to supply to our customers. Our goal is to continue to provide products that our customers want and at competitive prices. We do this in part through the remarkable hard work of our employees and the determination they have both in their personal and professional lives.